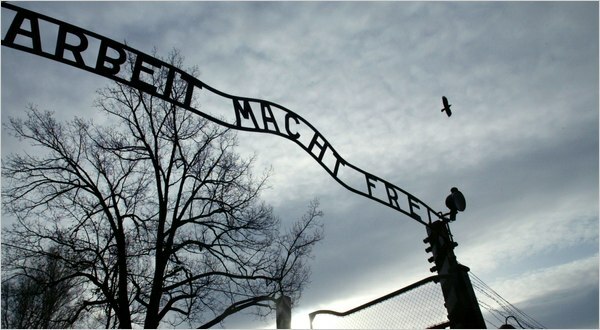 “The Polish police said Friday that the iron sign over the gate to the Auschwitz memorial with the infamous phrase ‘arbeit macht frei’ — ‘work sets you free’ — has been stolen. “Katarzyna Padlo, a police spokeswoman, said the police believe it was taken between 3:30 a.m. and 5 a.m. Friday. “Ms. Padlo, who was quoted by The Associated Press, said the sign over the main entrance to Auschwitz, the former Nazi death camp in southern Poland, near Krakow, was removed by being unscrewed on one side and pulled off on the other. She said the authorities immediately launched an intensive search. “The sign was erected soon after Auschwitz-Birkenau, the largest Nazi extermination camp, was built in May 1940, and more than a million people died during the four-and-a-half years of Auschwitz’s existence. The victims were mainly Jewish men, women and children but included Polish political prisoners, Soviet prisoners of war, Roma families, gay men and lesbians, people with disabilities and prisoners of conscience.